For all of our frequently asked questions about Access Levels, check out this guide. This article contains a list of Access FAQ based on support questions that we've received. How can I add other access levels? To add a new access level please get in touch with our 24x7 support team, who will be able create these for you. How can I change other user’s access levels? To change a user’s access levels, simply edit their profile in the ‘People’ tab. Scroll down to ‘Job Information’ and select their new Access Level via the drop-down box. Click ‘Save Details’ when you’re finished. How can I customise existing access levels? Access levels can be customised to suit your business needs. However, much like adding access levels, we recommend reaching out to a Deputy support team member. What access level can see other employee’s contact information? System Administrators, Location Managers, and Supervisors can see employee contact details, however, they can only see details of people below them on the structural tree and not of people on the same level. Why can I not edit my employee’s contact information? Deputy does not allow editing of another user’s contact information for security purposes. For example, if an employee changes primary email address, then that employee can change the details accordingly. An employer may not know when this occurs. Can someone under the ‘Supervisor’ access level approve their own and other Supervisor’s timesheets? 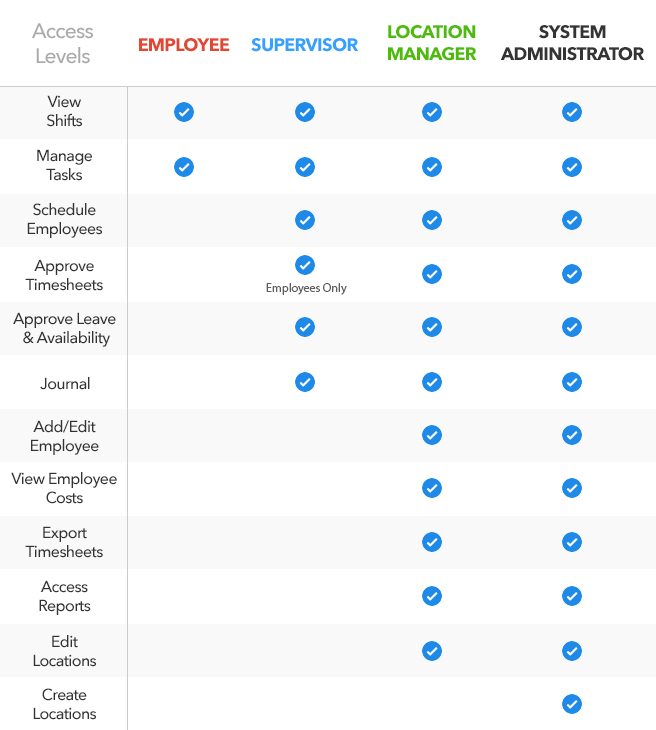 Supervisors can only approve Employee level timesheets. Can we allow employees to view the Scheduling page? Yes, employees can view the Schedule page if you set up the correct permissions. You can do this within Location Settings. For more information about this, check our our Change Employee Schedule View Permissions help doc. Is the System Administrator/Owner considered a user? Yes, any active user using the system will be considered a user and will be charged per their plan. To reset your password, simply click ‘My Account’ from the drop-down menu in the top right corner. After that, click ‘Edit Profile’ > ‘Security’ > ‘Reset’. You will need to enter your current password before you can change it to your new password.